So, about those leads. They're not dog leads or any ordinary kind of leads but two, frankly, ingenious little twists on something that we're too all familiar with - charger leads. 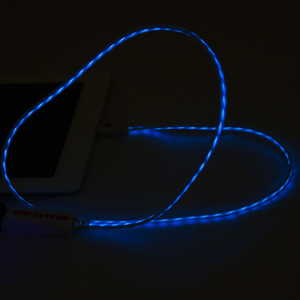 First, The Snugg Live Wire Flowing light charging cable for the iPhone 5. It looks like this. You can 'see' the electricity flowing from the mains to your phone. It's great. Just don't use it if you charge your phone at night at your bedside! The drawback with most leads is that they only fit specific devices. So, if you've got lots of different things in need of charging you'll need lots and lots of leads. 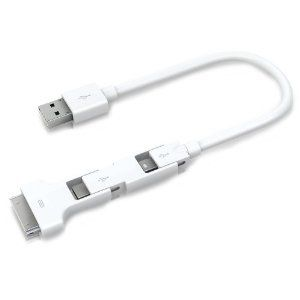 Or you'll need the Innergie 3-in-1 USB cable with three different attachments built-in, thus potentially eliminating at least two extra wires as well as the distinct possibility of losing the attachments. Very clever. 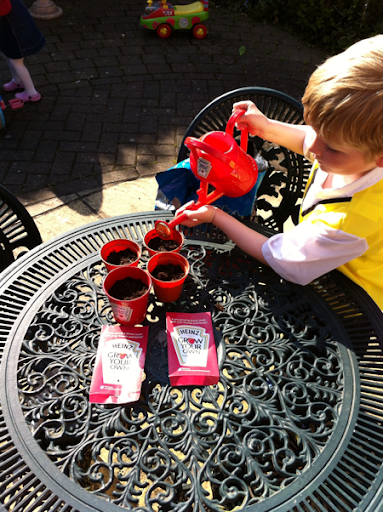 The long overdue arrival of some warmer weather this week gave us the chance to get out in the garden, and to plant our very own tomato ketchup tree, sent courtesy of Heinz. (Well, tomato seeds anyway.) They're in a lovely little branded pot, watered with a lovely little branded watering can and will - we hope - grow into some lovely little non-branded tomatoes we can enjoy during the summer. If we get one, that is. Watch this space, both for tomatoes and for summer. Finally, that eBay store. Well, I say 'store' - themed listing, more like. And the theme is 'Father's Day'. Not long to go now, you know. So, why not take a look? Being a dad myself, y'see, I know a bit about dad stuff and - being a dad - I'm also a dispenser of pocket money, often in large quantities when it comes to birthdays, anniversaries and things like Father's Day. So I thought, why not lost a few things dads might like - a cut-throat razor, a shaving brush, luxury shaving cream, a smart Automate coat hanger you attach to the back of your car seat to hang your jacket on, that sort of thing. They all start at 99p - so pocket money prices - and they're all new. There's some other stuff on there as well, like a dining room table and chairs but I don't anticipate that being a 'must buy' for Father's Day (although if dad wants one it's a bargain at just £25!). So, happy Father's Day (when it happens). Happy bidding (should you wish to). And Happy Sunday (what's left of it).